Show off your piercings with one of our super-bright neon bananabells. These belly bananabells make it easy to stand out, with highlighter colours and awesome disco patterns. They are easy to wear and come in a great choice of designs to suit your look. We have hundreds of different bananabells, but these are some of our loudest! ‘Plain’ doesn’t have to mean dull. These bananabells come in a huge selection of neon colours and materials, including biocompatible metals and UV options. Below are three of our favourites, including the flexible purple bananabell on the left. This bananabell is made from flexible PMMA that bends with your body, putting less stress on your piercing and reducing the chance of getting it caught on clothing. Mix it up with these cute patterned bananabells. The lurid colours give a trippy look that’s perfect for updating your look. Bright, gorgeous and great value, these bananabells are a fab choice. This entry was posted in Navel Bananabells and tagged Bananabell, Bananabells, Belly Bananabells, belly button bananabell, navel bananabells on October 2, 2012 by Piercing Guru. Get a gorgeous new look with our range of reverse belly bananabells. These bananabells are a great alternative to regular belly bars. As you can see from the example on the right, reverse bananabells are like an upside down version of regular belly bars. 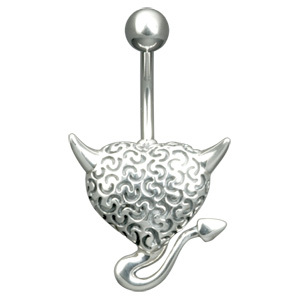 They have a charm that hangs from the top ball, so the charm hangs down in front of your piercing. They give you a very different look and are a great way to update your style. Here at BJS we have a fantastic range of reverse belly bananabells, including the fab designs you can see below. These gemstone belly bananabells offer you something really different in terms of style and sparkle. 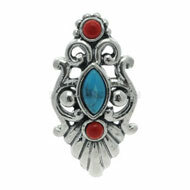 We have delicate crystal bars like the one on the left and vibrant bohemian designs like the central and right hand ones. Personally I love both styles – the crystal bar has such an elegant shape while the earthy gemstones look beautiful in their own right. Our silver reverse belly bananabells give you effortless style and elegance. 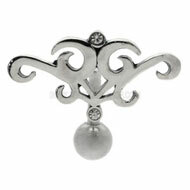 They feature solid silver charms and diamond crystals that really shine. They look glamorous but understated, perfect for adding sparkle to any outfit. We have a great choice of silver bananabells but below are three of our top sellers. This entry was posted in Belly (Navel) Piercings, Navel Bananabells and tagged Bananabell, Bananabells, Belly Bananabells, belly button bananabell, navel bananabells, Reverse Bananabell on August 21, 2012 by Piercing Guru. Glitter is always a fab way to update your look and our glitter belly button bars make it easy for your piercings to get in on the action! 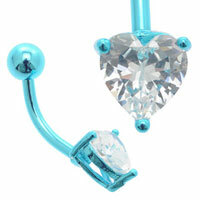 We have a huge range of belly bars and these sparkly options are some of the best. Whether you’re after subtle sparkle, cute colours or full on glamour, these glitter belly button bars are a must have for anyone with a navel piercing. 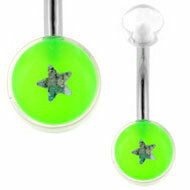 These glitter belly bars combine gorgeous colour with UV magic and complete comfort. They are made from a special kind of soft UV-reactive PMMA. The bar is soft and flexible, so it bends with your body. 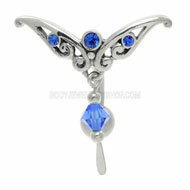 This is very comfortable and puts less stress on your piercing, especially during healing. The screw-on balls are packed with glitter and the whole thing glows brightly under UV light. 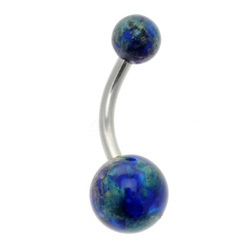 Another comfortable option is our range of blackline glitter belly bars. 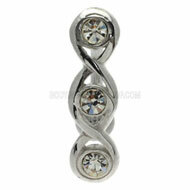 These bars are made from one of the most biocompatible materials available for body jewellery. Blackline is specially coated titanium, so compatible with the body that it is used to make some pacemakers. It is completely non-irritating and can shorten healing times, perfect for sensitive piercings and the easily irritated. These bars combine all the comfort of blackline with gorgeous brightly coloured glitter balls that really sparkle. Fabulous! This entry was posted in Belly (Navel) Piercings, Navel Bananabells and tagged belly button bananabell, Belly Button Bar, Belly Button Bars, Belly Button Jewellery, Navel and Belly Button Jewellery on January 24, 2012 by Piercing Guru. Brighten up your body jewellery with one of our glitter bananabells! These cute belly bananabells look gorgeous and will definitely get you noticed. They come in a huge range of colours and designs, so it’s easy to customize your look or colour coordinate your body jewellery. And because our glitter bananabells start at just £2.49, you can afford to have one for every day of the week! Purple glitter is a great choice to sweeten your look – not as cutesy as pink but still with plenty of girly glamour. These glitter bananabells are just some of the purple ones that we have. Both the purple stars and heart bananabells feature top quality 316L surgical steel stems. This type of surgical steel is non-irritating and feels very comfortable to wear in your piercings. The purple UV glitter bananabell is made from flexible PMMA, a durable biocompatible plastic that bends with your body. It is soft and forgiving, perfect for sporty types – or if you just tend to get your bananabell caught on your waistband a lot! When it comes to cute style, if you’re going to go with glitter, you may as well go all the way and make it PINK glitter! These pink glitter bananabells are simply gorgeous. They sparkle and shine to really show off your pierce. 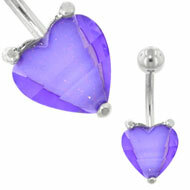 Like the purple ones, they are made from a range of comfortable PMMA and 316L surgical steel. This entry was posted in Acrylic Body Jewellery, Belly (Navel) Piercings, Navel Bananabells and tagged Bananabell, Bananabells, Belly Bananabells, belly button bananabell, navel bananabells on January 10, 2012 by Piercing Guru. Update your look this year with our exceptional quality belly bars this Christmas. We have a wide range of exciting designs and comfortable materials which will light up your look and impress all your friends. Impress your friends with your fabulous white cluster navel bananabell which will catch the light wonderfully and leave you glittering with style. This fabulous body jewellery piece has a smooth G23 surgical Titanium stem and two silver cluster balls. Everyone will be amazed with this fabulous bananabell which will look incredible worn to special occasions, parties and nights out clubbing. This will make a fantastic Christmas gift for a loved friend or family member this year, so make sure you get your hands on one of these fantastic value cluster bananabells before everyone else does. It will immediately update your style and coordinate perfectly will all your shimmering silver jewellery and glamorous party dresses. This inexpensive body jewellery piece will not only looking fantastic but will feel light and smooth in your navel piercing. Spice up your style with this wild pink tiger print bananabell. Our wonderful 316L surgical steel body jewellery piece has two acrylic pink balls with an attention-grabbing black animal print. This fashionable and comfortable bananabell will coordinate with all your animal print outfits and vibrant jewellery. Everyone will be amazed with the soft feel and lightweight material which will stop irritation. You can be sure to stand out from the crowd by wearing this exciting and easy to insert body jewellery piece. This bananabell will put a smile of your face and will boost your style. This entry was posted in Balls and Accessories, Belly (Navel) Piercings, Gifts and Accessories, Navel Bananabells, Titanium Body Jewellery and tagged Acrylic Ball, Acrylic Balls, Ball, Bananabell, Bananabells, Belly Bananabells, belly button bananabell, navel bananabells on December 13, 2011 by Piercing Guru. Pretty up your style with these cute blackline bananabells, perfect for absolutely any occasion. Choose from a wide range of glimmering jewelled bananabells which will add a touch of girly glamour to your look. Everyone will be impressed with your dazzling new jewellery piece and will love one to wear with all their favourite outfits. Get a captivating new look with this amazing quality and value dark blue bananabell. This eye-catching deep blue jewel will shimmer in the light and instantly grab everyone’s attention. 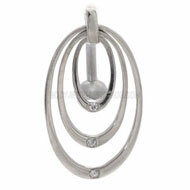 Not only will this navel piece look stylish but it will feel amazing because of the surgical-grade G23 titanium. Blackline is fantastic for anyone who has experienced irritation from other materials. All your friends and family will be jealous of the sparkly finish and attention-grabbing colour that will drastically enhance your appearance. Biocompatible and extremely comfortable to wear, make this sweet blue bananabell the newest addition to your new look. Feel elegant and glamorous wearing this clear double jewelled navel bananabell. 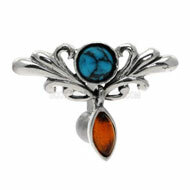 This fantastic piece of jewellery has two dazzling clear jewels which will look great against the shiny black coating. This incredible bananabell is made from surgical-grade blackline titanium which will speed up healing and reduce irritation. Whether you’re going to a party, day out or concert, this fantastic body jewellery piece will keep you looking stylish and feeling great all day long. Make sure you get one of these double jewelled bananabells as a gift for a loved friend or family member this Christmas, they will really love the fabulous glossy finish and eye-catching design. This entry was posted in Belly (Navel) Piercings, Blackline Body Jewellery, Navel Bananabells and tagged Belly (Navel) Piercings, Belly Bananabells, belly button bananabell, Blackline Body Jewellery, navel bananabells on November 7, 2011 by Piercing Guru. Make a bold statement with our wide range of gorgeous gold plated bananabells. These shimmering pieces of jewellery will look great in your piercings. These are available in a variety of designs which will coordinate perfectly with all your favourite outfits and accessories. Everyone will instantly fall in love with the cute designs and eye-catching colours which will light up your entire look. Simply slip this cute gold plated pink heart jewel bananabell into your piercings for a shimmering new look. This glittering gold jewellery piece with a gorgeous pink heart jewel will definitely enhance your appearance and shock everyone. Stop uncomfortable irritation and add a touch of girly glamour to your style with this smooth polished gold plated bananabell. Ideal for any occasion, this affordable gold plated body jewellery piece is suitable for healed piercings. The cute heart jewel set in the large gold claw will catch the light wonderfully and will leave you sparkling all day long. Pair our eye-catching gold plated 5mm ball barbell with this sweet pink heart jewelled bananabell. Simple yet beautiful, this lightweight gold plated bananabell will instantly light up your look and will add a touch of sparkle to all your favourite outfits. Ideal for healed piercings, this comfortable bananabell will stop irritation. Our smooth polished jewellery piece with ball sizes of 5 and 8mm will feel and look amazing on. Make a bold statement by wearing this gold plated bananabell everywhere or give this to someone you love for a special occasion; they will definitely love wearing it in their belly piercing. Pair some of our gold plated jewellery with this dazzling bananabell for a beautiful finish which will impress all your friends and family. This entry was posted in Adult Body Jewellery, Belly (Navel) Piercings, Gold Body Jewellery, Navel Bananabells and tagged Bananabell, Bananabells, Belly Bananabells, belly button bananabell, Gold Body Jewellery, Gold Jewellery, Gold Navel Jewellery, Gold Piercing Jewellery, navel bananabells on September 30, 2011 by Piercing Guru. The navel bananabell is a piece of jewellery designed for you ladies with your navel (belly button) pierced. Bananabells get their name from their curved shape, which not surprisingly is similar to that of a banner. This allows the top of the “banana” to be hidden within your navel and the bottom of the “banana” with decoration on to be sitting proudly just below your navel. Before we get carried away with ourselves, we want you to be safe. Make sure that you only get your navel piercing carried out by a trained professional, no using a hole punch will not work! Also remember that you should not change the jewellery until it is fully healed, which usually takes about six weeks. We do not believe that expressing yourself should cost a fortune, so we are offering you a range of basic navel bananabells for as little as £2.49. They are simply a coloured ball at the bottom and top of the “banana”, but the cool thing is that you can get them in UV and Neon. They are a great piece for you ravers out there, you can choose from: orange, green, yellow, purple, blue, pink, white, red and black. For you girly girls out there, we have a lovely floral range of navel bananabells. The bottom of the “banana” has a clear ball with a rose inside, from the conventional red rose to the more unusual blue rose. These are a lot more comfortable than the standard metal ball that you will get pierced with, as the acrylic ball is a lot more forgiving. Your bank balance will also forgive you, as they are only £2.99 each. Marble is an expensive and luxurious material, so we are looking a sophisticated lady to buy these lovely marble navel bananabells. They glisten against your skin and look much more expensive than their £2.95 price tag. The Blue Azurite variation looks slightly like the earth, green areas floating in a glossy blue mass, but our favourite piece is the amethyst and copper navel bananabells. The balls on both the top and bottom of the bananabell glisten with black, copper and purple depending on the light, a gorgeous iridescent item of jewellery. You can also get this style of the bananabell in black and gold as well as black and green. One of our more expensive Bananabells ranging from as little as £3.95 each, but we believe that they are definitely worth paying the extra money. If you had problems with your piercing healing or you are allergic to certain materials, you may want to play it save with surgical steel jewellery. The Bananabells can be worn everyday making them excellent value for money and unlike the surgical steel jewellery you got pierced with, we provide some funky designing including: playing cards, devil heart, wild cat and a cross. So check out our entire range for a funky addition to your style. This entry was posted in Belly (Navel) Piercings, Navel Bananabells and tagged Bananabells, Belly (Navel) Piercings, belly button bananabell, Belly Piercing, Body Jewellery, Navel and Belly Button Jewellery, navel bananabells on July 2, 2011 by Piercing Guru.